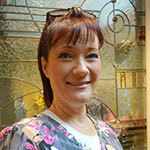 Kim has been with our office since 1994. She graduated from the Raymond Walters dental hygiene program in 1985 and has worked in pediatrics, periodontics as well as general dental practices. She takes great pride in her patient’s oral care and has developed a close relationship with many of her patients and their families. Kim and her husband Jeff have a great love for animals. They have three dogs and four cats. Kim loves drinking Pina Colada’s and getting caught in the rain.